Elena Ford: "For the first time in a very long time, everyone is working together on assets that everybody needs around the world." DETROIT -- Ford Motor Co. will use the launch of the 2011 Focus as a test case for something auto companies often talk about but rarely accomplish: the execution of true global marketing programs. The Focus, which will be unveiled at next month's Detroit auto show, represents the next step in the globalization of Ford's worldwide marketing operations -- an effort aimed at unifying messages and driving down costs through shared resources. 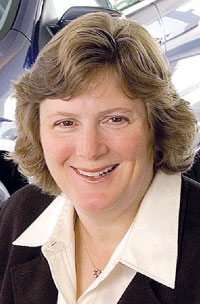 "We are driving synergies and working through all the markets," said Elena Ford, 43, director of Ford Motor's global marketing, sales and service operations and great-great-granddaughter of company founder Henry Ford. "For the first time in a very long time, everyone is working together on assets that everybody needs around the world." In the past, Ford's marketing leaders for North America, Europe and Asia did not collaborate on how many Web sites to use for a model launch, how to unify public relations or how best to use auto shows before a launch. Ford's marketing departments in 110 countries had the authority to create their own programs. That spawned a slew of TV commercials, photo sessions and auto show displays. Now, Ford insists that global departments work together to share resources and reduce costs. The 2011 Focus is the first example of that execution. Ten years ago, Ford used up to 15 ad campaigns for individual countries when it launched the Focus globally. This time it will use fewer than 10 executions for TV, online or events, the company said. "Campaigns that we've looked at for Focus could probably work in all markets with some tweaking for the different regions, but not completely different campaigns," said Elena Ford. "The way you get efficiency is to repurpose everything." Reducing the number of advertising executions could save Ford plenty. The company spent $2.45 billion on measured media around the world in 2008, according to Advertising Age, a sister publication of Automotive News. Jim Farley, Ford's vice president for global marketing and communications, said 10 percent of Ford's global marketing costs are spent on production. If Ford "could drive it down to 6 or 8 percent, that's 4 percent of billions of dollars that you could put back" into public relations, a media buy or a media integration, Farley said. To get regional buy-in, Farley said, he will return some of the cost savings to the media budget of Ford units that show results. George Rogers, global team leader for Ford's advertising agency, WPP Group, said Ford will see significant savings in production costs. He said Web sites might require only translation and cultural cues to be added, reducing the sites that need to be created. By bringing together marketers worldwide, Ford will allow marketing to become involved in vehicle planning when a program is approved. With more time, marketers can better plan each launch. Rogers said WPP has aligned its organization with Ford's new global marketing and has dropped the territorial walls within each of its agencies, including creative departments. The Focus campaigns will feature work from WPP personnel in China, Latin America, Europe and the United States. Said Farley: "Now we speak as one entity, all the way down to Tier 3" individual dealer advertising.